Don't believe the critics, liver's delicious and good for you. Just be sure not to overcook it! ⊙¹/₂ teaspoon of sugar (optional). ⊙500 gram (1 lb.) fresh liver of your choice. ⊙1 teaspoon salt, or to taste. ⊙¹/₄ teaspoon black pepper, or to taste. ⊙¹/₈ teaspoon cayenne pepper (optional). ⊙flour, for dredging the liver (optional). ⊙1 or 2 tablespoons butter. ⊙1 tablespoon chopped parsley or cilantro (optional). Make sure the liver is properly cleaned and trimmed. Slice the liver into thin pieces or steaks and score the edges all around to help prevent the liver from curling while it’s frying. In a bowl, mix the liver with the spices, vinegar, and oil and leave to marinate for 30 minutes or longer. Push the onions to the sides of the pan. If desired, dredge the liver lightly in flour. Add the liver to the pan and fry it for 5 to 7 minutes on each side, or until cooked through. Stir the onions occasionally while the liver is frying. 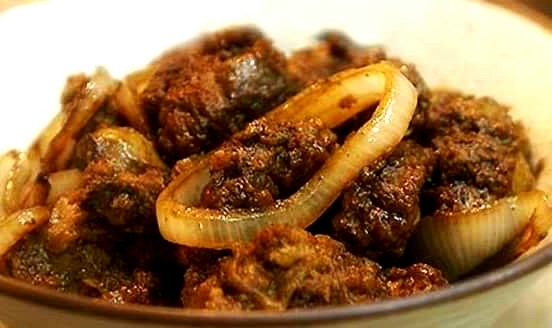 When the liver has cooked, transfer the meat and onions to a plate. Add the tablespoon or two of butter to the pan and swirl the pan to melt the butter and combine it with the juices to form a sauce. Serve the liver and onions immediately with the sauce poured on top. Garnish with a little parsley or cilantro if desired. This liver & onions entree was the best I've ever eaten in my lifetime. The liver was very tender and mild flavored.